The Villa Adriana was the retreat of the Roman emperor Hadrian, and the remains of its monuments are great examples of classical architecture. 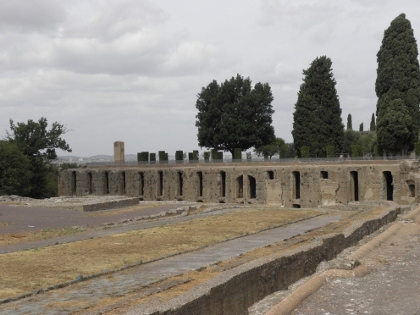 The villa was created in the 2nd century A.D. in the cooler hillside town of Tivoli, about 30 kilometers outside Rome. The Villa shows echoes of many different architectural orders, mostly Greek and Egyptian. Hadrian was a very well travelled emperor and borrowed these designs. 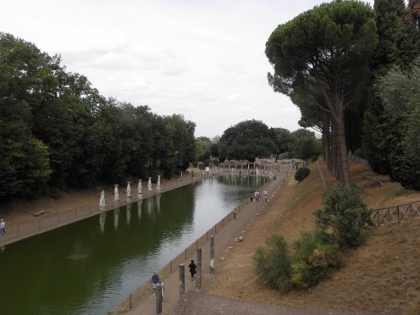 Villa Adriana is advocated as the most complete and well-preserved of Roman ruins. Despite of that, it is not very well known by the general public. In Tivoli it has to compete with the Renaissance Villa d’Este, which attracts most of the visitors to this town east of Rome. The Villa Adriana lies some 5km away, outside of the city center. A local bus (no. 4) will get you there, and the bus to Rome doesn’t stop far away either. Entrance costs 11 EUR. I did not know what to expect – somehow it sounds similar to the Villa Romana del Casale on Sicily. But in reality it is much different. The Villa Adriana covers and enormous area, 120ha. It was built as an ‘ideal city’, planned by Emperor Hadrian to entertain himself and his guests. 900 servants lived on the premises. In addition to its size, it is also remarkable how much of it still stands. Or stands again, as several buildings display clear signs of concrete or brick reconstruction. In the middle of summer this will be an excruciating hot site to visit – it’s all open land without shade, dusty, and the main monuments need quite a hike to get there. Signage is scarce, and there’s nowhere to buy a drink. During my visit in early September it was cloudy but still about 25 degrees. I did my best to find all interesting sights, but must admit that it was exhausting. The problem with the site is that there are no clear highlights: there are some mosaics, a few marble columns, plus the remains of many Roman structures built to enjoy and relax. None of them really stand out however, there's almost no decoration left and I found it all very bland. I went to Tivoli in April 2015. Making efficient use of the four day Easter weekend involved flying to Rome Fiumicino early on Good Friday, where we met up with some friends fresh from the centre of Rome. We hired a car and drove straight to Tivoli, where we would spend a night and visit two WHSs. The Villa Adriana is really more of a small town, created in large part by the emperor Hadrian, who was a keen amateur architect, in the second century AD. He decided that an out-of-town retreat would be just the thing he needed after he made himself less than universally popular in Rome by having several senators put to death. 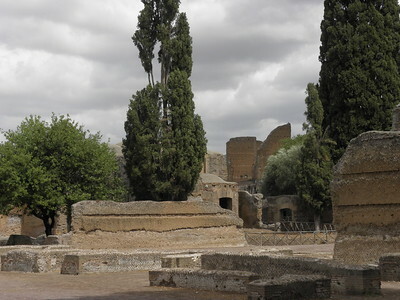 The site is a bit of a mishmash of buildings of various purposes, which include a grand villa, temples, a large bath house and the water feature known as the Canopus. Around the Canopus Hadrian placed statues that he particularly wanted to show off to his visitors, such as a row of ‘Caryatids’ designed to imitate the female-form columns of the Erechtheion on the Acropolis. Hadrian was a philhellene, or an admirer of all things Greek, so he had numerous statues brought over or copied. He was possibly the first Roman emperor to sport a beard – not, as was cruelly suggested, to conceal acute acne, but because his heroes the Greek philosophers were similarly hirsute. On the other side of the site we found the atmospheric Temple of Venus. This area has some of the best views of the Tiburtine Hills. There have been some significant finds at the Villa over the years that have ended up in major national collections across Europe, such as one of the best Roman copies of the lost Greek Discobolus statue, which you can see nowadays in the British Museum. Villa Adriana, the summer residence of Emperior Hadrian (used when he didn't travel across his vast empire and had walls built along its borders to protect it), is located a few kilometres outside of Tivoli proper, and can be easily reached by bus from that town (the stop is actually quite close to Villa d'Este). It is a vast archaeological park (the largest palace ever built by a Roman emperor) with many different buildings in various states of preservation - some look like new, some are in ruins, and some look like they have been under renovations for many, many years (e.g. the Teatro Marittimo). A leisurely walk takes at least 2-3 hours, and in some places, away from the crowds of schoolkids, it is easy to imagine yourself in Hadrian's footsteps. He was fond of Greek and Egyptian architecture, and you can easily recognize these influences in many of the buildings, e.g. in the Canopus pond with its Greek statues. The site definitely needs better maintenance (i.e. more funds), but it still gives a fascinating insight into ancient history. I visited this great WHS in March 2014. I visited Rome several times but this time round I decided to drive to Tivoli for a day trip. 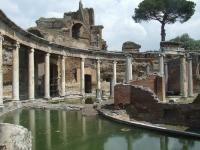 Villa d’Este and Villa Adriana are quite close to each other by car and it is feasible to visit both in 1 day. Hadrian’s villa is huge and 2-3 hours to be able to scrape the surface and understand its importance. The highlight of my visit was the Canopus with the replica statue of Mars. There are several thermal baths, columns, mosaics, etc to keep you busy exploring. It's definitely one of Italy’s top WHS. 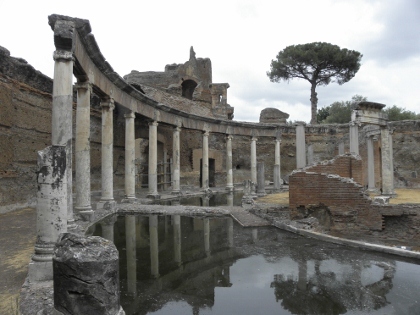 After visiting Villa d'Este I returned to Tivoli's Piazza Garibaldi and caught a #4 bus to Villa Adriana, 6 kms away. Although the villa is in ruins I was surprised to find remnants of buildings standing up to three storeys high. It was not hard to envisage the extent and grandeur of this villa and its surroundings. Villa Adriana is the most amazing serene place you could ever imagine! You unfortunately have to take a train to the town, two different shuttles which are very inconsistant, but it is worth it! It took five hours just to run around the 40% of the site which was open. Definately take a guide with you so that you know what you are looking at. It is quite a maze to figure out where you are in some spots but that is what makes it so special. When you enter there is an excavation site on your right, go past it and turn right before the modern building and there will be a beautiful path to a building which overlooks Tivoli... so amazing! Bring a bottle of wine, and a sandwhich from the market in tivoli, your camera, and enjoy!!! Historical Graffiti: By 18th century visitors, such as "the legendary architect/etcher Piranesi scribbled Piranesi 1741 into a grotto at Hadrian's Villa with a red crayon"